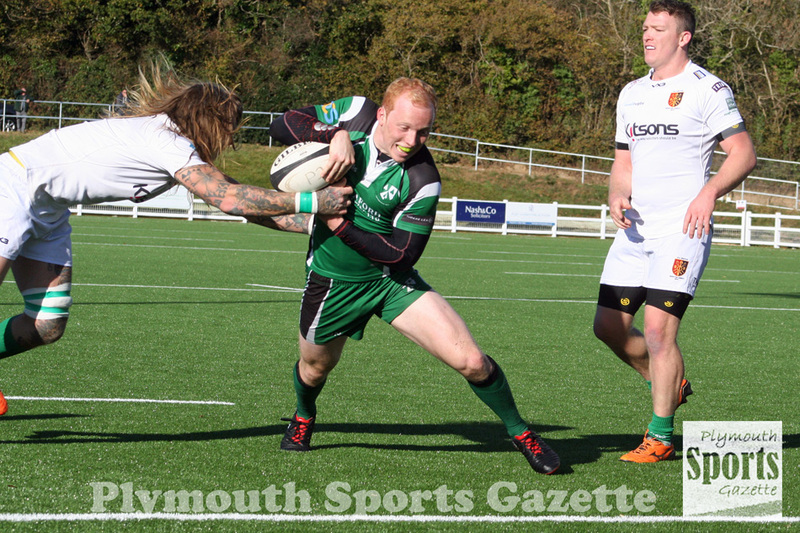 IVYBRIDGE claimed a third Devon derby win of the season with a 24-17 success over Newton Abbot at Cross-in-Hand. The Bridgers also managed four tries to pick up a full five points that keeps them second in the South West Premier table behind leaders Bournemouth. It was the perfect way for the South Hams club to bounce from their first defeat of the campaign last Saturday at Maidenhead. 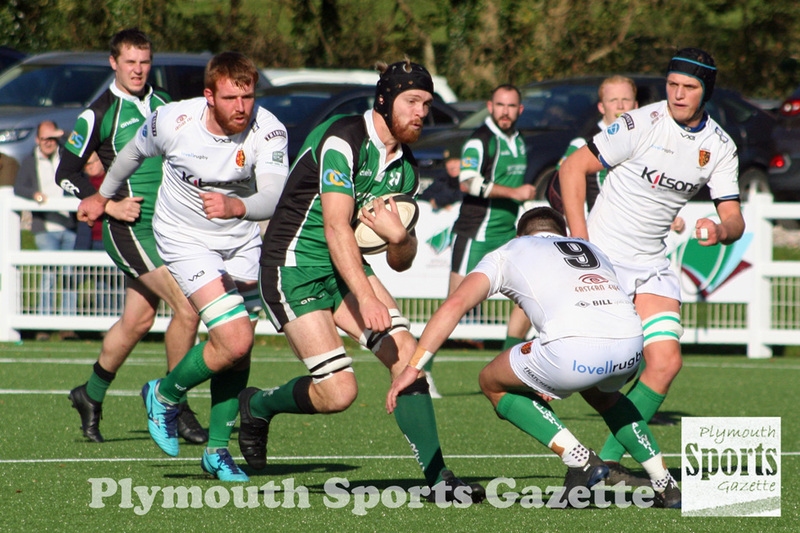 Three tries within the space of 20 minutes in the first half put Ivybridge on the road to victory in a game that also counts towards the Devon Senior Cup. Struggling Newton Abbot, with Matt Jess influential, played well for large parts of the match and scored a late try to pick up a bonus point. They have claimed nine bonus points in eight games, which shows how competitive they are, but they have surprising only managed one win. 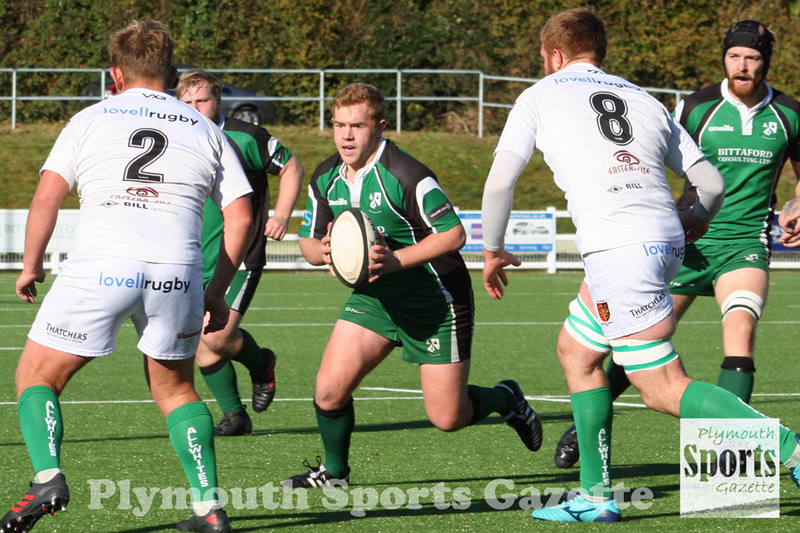 “Devon derbies bring the best out of any team,” said Ivybridge player-coach Lewis Paterson. “But I don’t think Newton Abbot are an under-performing side; they have just had a lot of narrow losses, but they are good a side and came out of the blocks firing. He added: “I think we just had that edge. I think we were just a little bit more relentless when we were attacking. Newton Abbot started quite well and they took the lead in the sixth minute when former Plymouth Albion back Tom Putt kicked a penalty. But then Ivybridge hit their visitors with three tries within 20 minutes. The first came from winger Damon Akerman, who showed great pace to score in the left corner after good play from a free-kick on the right. Then captain and full-back Charlie Briant went over on the right following good pressure after Newton Abbot lost a line-out. The third try came five minutes later. Akerman was stopped just short after a high tackle, but the referee played advantage and Ben Watts picked up the ball and scored in the left corner. Pinkus brilliantly added the extras from the touchline to make it 19-3. But three minutes from the end of the half, Ivybridge lock James Sloan picked up a yellow card and Newton Abbot made the home team pay when Ian Milton scored from close range following the line-out from the penalty. Putt kicked the conversion to leave the half-time score at 19-10 to Ivybridge. 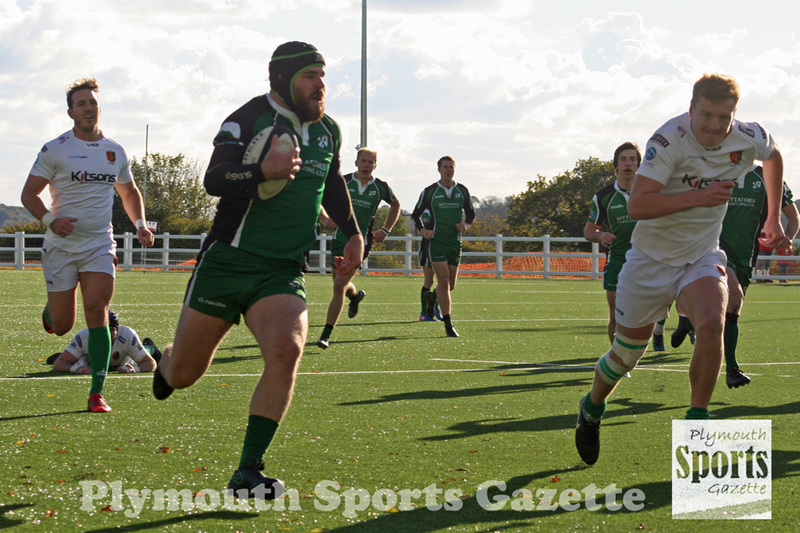 The second half started slowly but Ivybridge defended well with 14 players and in the 60th minute the hosts scored the all-important fourth try when Pinkus went over in the right corner after good play by Briant. That made it 24-10, but in the 80th minute Newton Abbot scored through centre Kevin Dennis, which Putt converted, to pull within a score. There was still time for one more play, but Newton Abbot lost the ball trying to play out from their own 22. DEVONPORT Services moved up to fifth in South West One after a 33-5 win away at bottom club Coney Hill. It was only Services’ second victory on their travels since their promotion and came courtesy of five tries – three in the first half and two in the second. Services went 5-0 up early on when Joe Wyatt scored in the corner. They then stole a Coney Hill line-out and scrum-half Keir Murphy got the ball and just went through five or six defenders to score under the posts for an easy conversion for Matty Anstis. Coney Hill were then reduced to 14 men for 10 minutes and from the penalty, Services took a quick tap and Luke Kenny scored under the posts. Anstis again added the extras to give his side a 19-0 half-time lead. But the hosts scored straight from the restart to reduce the gap to 19-5. Services, though, got on top at the scrum and they added a fourth try when they pushed the hosts off their own set-piece and Matt Gregory got the ball down for a converted try. Coney Hill had another player sin-binned and the visitors took advantage with Toby Knowles going over in the corner and Anstis brilliantly converted. Devonport wasted two great chances late on to add to their tally. SALTASH are out of the bottom three in Western Counties West after narrowly beating Chard 26-24 at Moorlands Lane. It was their third win on the bounce after beating Falmouth in the Cornwall Cup and then last week getting their first league victory of the season over Bideford. However, Saltash had to survive a few nervous moments at the end on Saturday after taking a 26-0 half-time lead. The hosts dominated the first 40 minutes and had scored four tries by the change of ends. Saltash took the lead in the third minute when full-back Ryan Cruickshanks scored after good play by winger Greg Eatwell. Fly-half Kieran Down added the conversion. Nine minutes later the hosts made it 12-0 when centre Max Venables crossed before Eatwell quickly added a third, which Down converted. Venables then claimed his second of the match before the break, with Down again converting to make it 26-0. Saltash, though, could have done without the half-time break coming as they lost their way in the second period as Chard came out in determined mood. The visitors scored four tries with the last one coming in the final moments. The visitors could have grabbed a draw had they converted their last try, but fortunately for the Ashes Chard’s goalkicker pulled his effort wide. PLYMSTOCK Albion Oaks are looking like serious contenders in the Cornwall/Devon League after beating much-fancied Torquay Athletic 27-15 at Horsham Fields. It was Oaks’ eighth win in a row in the league and keeps them top of the table. They now have a two-point advantage over Penryn and are nine points clear of fourth-placed South Molton. Oaks did the damage in the first half on Saturday. They scored three tries in the opening 20 minutes to lead 22-3 at the break. Centre Will Booth bagged their first try before Al Murray kicked a penalty and then player-coach Aiden Taylor went over for two tries. Although Torquay, who had beaten Plymouth Argaum 73-17 the previous week, came back into the game after the interval, Oaks were still able to bag a fourth try through Tom Richards to secure the full five points. “We’re chuffed to bits,” said player-coach Taylor afterwards. “We made hard work of it second half when we were playing against the wind, but I felt we were always going to win the game, especially after the way we played in the first 20 minutes. I think that’s the best performance we have put in during a first 20 minutes. We were outstanding. “The slope and wind did play into their (Torquay’s) hands second half and our ill-discipline was again our Achilles heel, as it seems to be every week. We let them back into the game, which was the most frustrating thing. 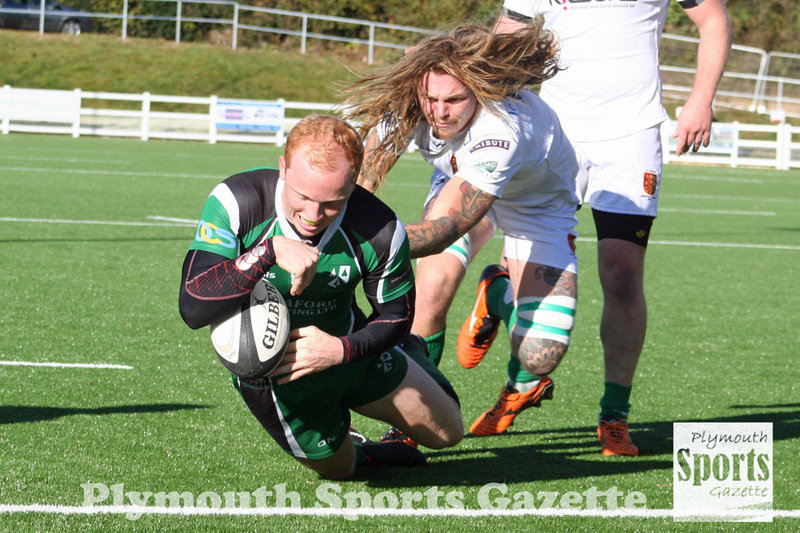 Plymouth Argaum overcame a major injury and availability crisis to beat Lanner 12-9 at Bickleigh Down on Saturday. The hosts, who had been struggling to get a team out, took a 12-3 first half lead and managed to hold on to claim four valuable points. It was Argaum’s first victory in a competitive match over Lanner, who had beaten them home and away for the last two seasons. “It was awesome,” said Argaum’s Stuart Quarterman afterwards. “It was brilliant and everyone is so chuffed. “We had real availability problems and had two ex-captains, Andy Jones and Andy Critchley, playing and they hadn’t played for years. The hosts went in front early when Tom Shepherd, playing as an emergency fly-half, scored from close range and Jake Turfery, who played despite a finger injury, converted. Shepherd, though, had to go off not long later with an injury. Lanner reduced the gap with a penalty, but Argaum went further ahead before the break when Turfery scored after good play by Tom Holliday. Visiting full-back Adam Harris kicked a long-range penalty after the interval to make it 12-6 before Nick Prout kicked another to leave Lanner just three points behind. The game was in the balance for the last 20 minutes, but Argaum held on for their fourth home win of the campaign. It was a good week for the region’s rugby’s teams as Tavistock also got a win. They beat struggling Withycombe 24-17 at Sandy Park. Tavistock took the lead when Ant De La Dour went over from a line-out move. But Withycombe hit back with a try by John Parkin. Tavistock, however, responded when Ed Nettleship claimed their second score when he kicked through and won the chase while the referee was playing advantage. Withycombe went in front with another try by Parkin, but on the stroke of half-time fit-again Tavistock captain Andrew Schuttacker scored from a driving maul to give his side a 17-12 lead. Jasper Cameron added a fourth try after the break after more good forward work to put Tavistock in command. Withycombe did score late in the game through Jimmy Holman to claim a bonus point and set up a nervous couple of minutes, but Tavistock, with Josh Birch and Schuttacker impressing, hung on. Old Techs claimed their biggest league win in two seasons by beating Torrington 43-10 at Weston Mill, despite suffering a major player shortage. Techs were struggling to get a team out with more than 20 players either injured or unavailable. Their goal had been just to get a side out to avoid any points deduction and 59-year-old prop Mick Wheatley and coach Shaun Bedford-Smith were among those drafted into their starting line-up, but Techs ended up producing their best display of the season. The hosts ran in seven tries in total with Matt Simmonds, Billy Evans and Eddy Ramazani each getting two apiece and their other coming from a penalty try. Joel Dicken kicked the rest of their points. Chairman Dave Evans, who was on the replacements’ bench, said: “Our main players really stood up and we played really well. We haven’t played like that for a while. Our support play was really good. There was always someone there on the shoulder. Torrington, who were only 19-5 down at the break having played against the strong wind, could only manage two tries on the day which came courtesy of Jamie Todd and Blaine Quinlan. The win has moved Techs up to eighth in the table, overtaking Torrington and Totnes, who lost 19-15 to OPMs at King George V Playing Fields. OPMs are now up to fifth in the standings after their third league win of the season. The match could have gone either way, but OPMs showed good game management in the closing stages to see it out. Shaun Grundy and Mark Hardy scored tries for the hosts in the first half, with Henry Matthews adding one conversion. After the break captain Billy Garratt added a third try, which was also converted by Matthews. Totnes’ points came from tries two by James Ruddock and a penalty and conversion from Steve Chapple. The Old Boys were pleased with the way they bounced back after losing 50-22 away at Torrington the week before.